In the beginning, there was a thought, and that thought grew into an idea, which became a project. And that was good. We here at Woodstock Soapstone are always creating, tinkering and thinking outside the firebox. There are a lot of old woodstoves still in service that predate EPA regulations. These are hefty stoves, made of cast iron or welded from plate steel and lined with firebrick. Many are well over 30 years old, and might last another 30 years if the firebricks are periodically replaced and appropriate parts and gaskets maintained. In our race to zero emissions, we thought we would take a side trip, a detour if you like, and look at a situation that is painful to us. How can we get these old pre-EPA-regulation stoves that are still being used, to burn with more heat and lower emissions? These old stoves are not efficient, or clean burning. Other people have (obviously) thought about this problem. 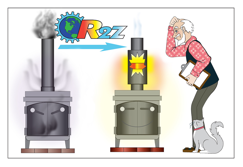 In fact, in 2014, the Puget Sound Clean Air Agency had a retrofit design challenge to encourage development of retrofit pollution reduction devices for woodstoves. Retrofit stove pipe catalysts have been available since the early 80's, but the concept has never been fully developed. One of the simplest catalytic retrofits is a catalytic damper that pivots in and out of the exhaust stream (below) in an effort to reduce emissions. Similarly, others have tried to extract more heat from the stovepipe by inserting a heat exchanger downstream of the flue collar. Some heat exchangers merely relied on convection, while others used a fan. We are in the very early stages of developing a retrofit stovepipe device that would increase efficiency and produce a cleaner burn in older wood stoves. We are eager to use today’s technology and improved materials to create a device that both increases heat output and reduces emissions. We are in the early stages of getting baseline data for how some of these older stoves actually perform. We have already started to fiddle around in the lab and some of the early signs are encouraging, though there are some difficult hurdles we will have to get over before we can even think about a commercially viable retrofit solution. Consistent with our other recent projects, our goal will be a device that is simple, effective, and affordable. We are considering making the data and development of this project publicly accessible. Many of our customers are engineers, and we can use all of the thoughtful input we can get. Again, we are very early in the project, but stayed tuned for the next chapter in this newest adventure here at Woodstock Soapstone. Great Idea! I currently use an ancient Grandpa Bear Fisher to heat my woodworking shop, and would love to be able to retrofit it for greater efficiency rather than scrap it for a newer stove. If you need Beta testers, I'm in! Can't wait to see how the product develops! I'm in the process of repurposing my old Nashua to heat my 30x36 pole barn. Any way that I could get more heat and a cleaner burner would be great. I have a fisher mama bear that heats great. and would be interested in testing out something like this. I am curious as to how putting an "After burner" in the chimney even right off the stove would really create more heat. Vs just cleaning up the emissions.